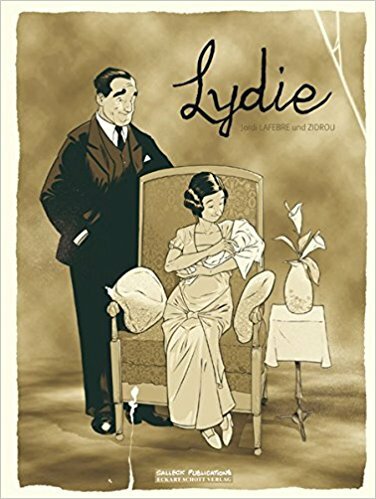 Lydie is a short tear-jerker that rewards readers with beautiful artwork and a compelling plot. Set in a French cul-de-sac in an unnamed French town, Lydie tells the story of a set of neighbors that band together to help Camille, a mentally impaired French girl, in a very unusual way. The street is nicknamed mustachioed baby court due to a graffitied baby on a soap billboard at the end of the street. There are many points-of-view depicted in Lydie including from a statue of the Virgin Mary located on one of the buildings. Set in 1932, life was both harsher and more neighborly than it is today. Camille loses her baby named Lydie during childbirth. A few months later, Camille believes that angels have brought back her child from heaven. First her father and then all her neighbors support Camille’s fantasy. By speaking to an invisible child who grows increasing older as the novel continues, the neighbors help Camille deal with her grief of her dead child. The end of this novel is the best part of all. Since this graphic novel vividly depicts life in all its harshness, it is recommended only for adults. While it is ultimately a feel-good plot, it is also a true tearjerker. The artwork is very good too. 4 stars! Thanks to the publisher, Europe Comics, and NetGalley for an advanced copy.